The UWF Libraries Department of Digital and Learning Technologies maintains and supervises the UWF libraries digital technologies, IT infrastructure and libraries main online presence. This includes library web redesigns, site information architecture, new and existing information management systems and digital learning programs related to library technologies. Departmental activities range from exploring new system possibilities to troubleshooting existing electronic resources to reimaging systems to implementing new hardware/software configurations. The department is also responsible for the libraries technology policies and procedures, and development of technology related statistics including web statistics. Most recently, the department has been heavily involved in envisioning and building Skylab:The University of West Florida's 21st century learning space to be housed on the libraries fifth floor. Digital and Learning Technologies also coordinates the larger library management systems (e.g., SOLR/Lucene (SOLANGO), ALEPH), digital programs, online services, and projects with other library department/unit heads and university and state stakeholders such as the Florida Computing Library Association (FCLA). The Department of Digital and Learning technologies supervises the development and coordination of the libraries online web presence, including synergies with the larger university website and state academic libraries, investigation and implementation of innovative new technological possibilities, interface, design and development, and maintenance of the library website. The department advises and collaborates with faculty, graduate students and interested stakeholders on strategic technological and program infrastructure requirements for digital libraries, multimedia programs, user imaging and digital services, library digital project development and new digital initiatives for the libraries and wider university such as the universities 40th anniversary online visual archive (rationale). The department is committed to the identification, exploration, and assistance in the implementation of promising new technologies and larger technological initiatives for the libraries. In the past years, the department has initiated and facilitated online projects such as Books and Bytes: the UWF Libraries Weblog (background), library Facebook and Twitter profiles and Archon an open source archival initiative to place all of the UWF Special Collections Holdings and Archival catalog into an Online Database and Digital Archives. Presently, the department works in several larger shared state consortial computing endeavors including Metalib: A Federated multidatabase search engine (background), SFX, a multidimensional link server, Aleph 19.5 an online library management system, SOLR/Lucene (SOLANGO), the libraries new millennia catalog and is a state university beta tester for PrimoCentral a new millennia discovery tool. Interoperability, interconnective functionality among several of these information systems and integration on the libraries web presence are key departmental trajectories. The department is also involved and committed to the coordination of collaborative interdisciplinary digital library project teams and wider university/library technological initiatives and is open to wider university, state, national and international collaborations. We are especially interested in projects involving information visualization, multimedia, digital libraries and innovative new technological collaborative possibilities and are committed to new technological possibilities and directions. Please feel free to contact Ray Uzwyshyn, ruzwyshyn@uwf.edu if you would like to discuss possibilities or current further. The Department of Library Digital and Learning Technologies is involved in conducting research and pragmatic implementation related to digital library and learning technology services, products, hardware, and software related to the library’s website and other digital/library functions. The department is committed to standards of digital stewardship, new metadata standards, resources for digital libraries and issues of digital copyright. From 2007-2009, the department completed an innovative two year statistical project SATELITE which looked into the intellectual knowledge landscape of the UWF community through information usage (rationale). The department conducts research related to specialization in the unit and more generally to library information systems and information technology. In this manner, the unit conducts a University of West Florida Digital and Learning Technology Workshop and Speaker Colloquia Series to keeping library administration, faculty, staff and the wider university community informed of new technology developments. Past seminars have included workshops and speakers on virtual worlds, distance learning softwares, podcasting, concept mapping, digital library system management tools, social networking applications the road to RDA/FRBR standards and new information discovery tool possibilities. The department promotes professional development activities include improvement of professional knowledge and performance through praxis relating to technology and sponsors attendance and participation in related professional meetings and workshops. The department of Library Digital Technology and Learning service responsibilities include University libraries technology governance through service on and congruence with university, state and national library committees and oversite for the libraries Web presence and systems, hardware and software. The department serves on the libraries Automation, Collection Development, and the Electronic Collection Development Committees in relation to technology issues and various state and national technology groups including information science and information technology organizations at local, state, and/or national levels. On state levels, the department has been active in both the state Digital Initiatives Subcommittee and Metadata standards subcommittees. The Digital & Learning Technologies Department installs and maintains all terminals, personal computers, servers and related peripherals that are used in the John C. Pace Library, Fort Walton Beach and Curriculum Library. Most recently, the department has been involved in envisioning and building the Skylab, a new twenty first century learning space for the libraries to be housed on the top floor of John C. Pace library. Digital Learning departmental staff aslo administer the library's Local Area Network, installing and maintaining all program and data files located on the LAN servers. The staff administer and maintain all of the Library's Server Systems and maintains Library specific services and software such as Illiad and Aleph Print Daemons and services. The staff of the Digital & Learning Technologies Department (850-474-2440), is located on the first floor in library administration. If you already have access to the Internet, simply point your browser at the library's homepage address http://library.uwf.edu. If you do not have Internet access, and you are a UWF student, faculty or staff member, you may obtain connection information and instructions from the Department of Information Technology Services, Open Access Computer Lab, Building 79 (850-474-2075). If you are not a UWF student, faculty or staff member, you will have to obtain the necessary software and an Internet connection from a commercial Internet Services Provider (ISP). 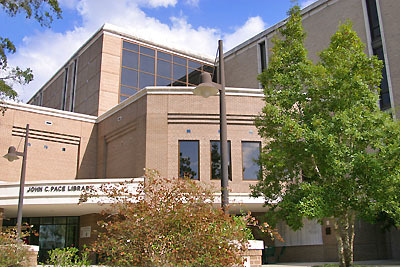 All services are available within the John C. Pace Library. Contractual license restrictions limit the accessibility from remote locations. The Subject Research Guides reflect the individual databases available within each service and indicates any limits of accessibility. "Envisioning the Skylab: The New University of West Florida Libraries 21st Century Learning Space"(Panel Presentation). 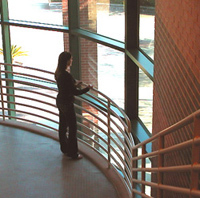 For Academic Learning Spaces: Invention, (Re)Invention and Innovation, June 7&8, 2010, Florida State University. (PDF), Books & Bytes Article. 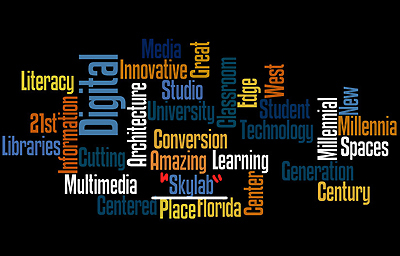 Skylab Information Literacy Classroom, Multimedia Studio and Media Conversion Center Proposal 2010 (Awarded: 167k). Arbitrage Opportunities for Image Search: Changing Metaphors, Game Metadata and Gathering Common Sense. Bulletin of the American Society for Information Science and Technology (Published PDF). Special Issue on Visual Search and Retrieval. July/August 2009. Prototype. Repurposing Open Source Software for Agile Digital Image Library Development: The University of West Florida Libraries Model, D-Lib, Sept/Oct 2008, Vol 14 Num 9/10, ISSN 1082-9873. SATELITE: A Statistical Analytic Toolkit for Endeca and Library Information Technology Environments, (background) 2008. Books, Bytes, Blogs and Wikis: Web 2.0 Tool Adoption for University Learning Environments - Presentation for UWF Academic Technology Centre, ITS Faculty Learning Series. Reverse Engineering Open Source Weblog Software for Agile Digital Image Library Development, Summary Project Brief, 2008, D-Lib. University of West Florida 40th Anniversary Virtual Exhibit. Project Proposal (PDF) , Living Visual Architectures Presentation, Static Beta, Interactive Beta Pensacola News Journal Feature , Saturday Sept. 22, 2007 "Virtual Tour Offers Tour of UWF's Past"
Metalib, Beta Cross Database Metasearch Database Resource Discovery Tool. With Caroline Thompson, Head of Reference. "Human Knowledge Seeking and Information Visualization: Exploring New Possibilities". Thompson ISI 2006 Samuel Lazerow Memorial Lecture., Fall 2006.